Kuparinen, K., and Vakkilainen, E. (2017). "Green pulp mill: Renewable alternatives to fossil fuels in lime kiln operations," BioRes. 12(2), 4031-4048. Pulp mills are making increasing efforts to reduce fossil fuel use and carbon dioxide emissions. Lime kilns, which are typically fired with fuel oil or natural gas, use the most fossil fuel in modern pulp mills. A modern kraft pulp mill can be fossil fuel-free during normal operation if fossil-based lime kiln fuels are substituted with renewable alternatives. This study compared the production and use of various renewable fuels, namely, hydrogen, producer gas, torrefied biomass, lignin, and pulverized biomass, in lime kiln operations in a 1.5 Mt/a kraft pulp mill in South America to define the techno-economic optimum for the fossil fuel-free operation of the pulp mill. The attractiveness of each of the concepts was dependent on local conditions and especially the prices of fossil fuels and electricity. The results showed, however, that feasible options exist for the replacement of fossil fuels in lime kiln operations. Sustainability, emission control, environmental regulations, corporate image, self-sufficiency of fuel supply, and the price of fossil fuels are among the many factors driving companies to reduce usage of fossil fuels. In the pulp industry, a large share of energy use is already biomass-based (IEA 2014), and in normal operations, modern kraft pulp mills are usually self-sufficient in energy, with the exception of lime kiln operations. Fossil fuels are primarily used to reduce lime mud to burnt lime, and they are also used during upsets, start-up and shut-down, as well as sometimes for safety reasons to secure non-condensable gas destruction (Vakkilainen and Kivistö 2008, 2014). Thus, the lime kiln is typically the only unit operation utilizing fossil fuels during normal operations, and, consequently, the only source of fossil fuel-based emissions. Substituting fossil fuels used in the lime kiln with renewable fuels produced at the mill, especially if existing side streams are used, would make normal kraft pulp mill operations nearly fossil fuel-free. This study evaluated the techno-economic feasibility of integrating renewable lime kiln fuel production into the kraft pulp production process. The lime kiln in a kraft pulp mill converts lime mud, which is largely composed of calcium carbonate (CaCO3), into burnt lime, i.e., calcium oxide (CaO), and carbon dioxide (CO2). This thermal decomposition reaction requires a high temperature and occurs spontaneously when the lime mud temperature exceeds approximately 800 °C in a gas atmosphere containing 20% CO2. The gas temperature needs to be notably higher because of the poor heat transfer in the kiln (Arpalahti et al. 2008). Lime kilns are typically long, cylindrical rotary kilns. Lime mud is fed into the kiln at the feed end, from where the mud, because of kiln rotation and slight inclination, flows slowly through the drying and heating zones to the burning zone. External heat is brought into the kiln by combusting fuels in a flame at the hot end of the kiln. Lime kilns are usually fired with oil and natural gas. Alternative fuels originating from the pulp production process side streams are often co-combusted, but only in a few cases are they used as the main fuel (Francey et al. 2011). For example, methanol, tall oil, strong odorous gases, tall oil pitch, hydrogen, and turpentine have all been co-combusted with fossil fuels in lime kilns. Renewable fuels can be produced at the mill from available biomass residues or produced using renewable electricity from pulp mill operations. The processing of wood typically creates biomass residues such as bark, sticks, and fines. The amount of residue depends on the process, the wood type, and local conditions. For example, eucalyptus is usually debarked in the forest, which decreases the amount of woody residue at the mill. 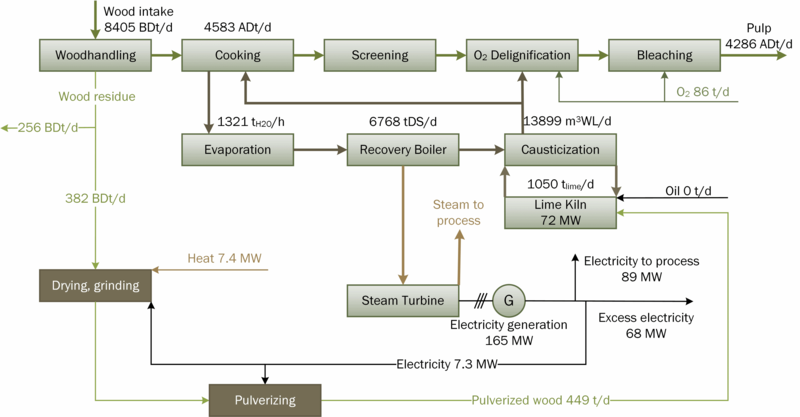 Modern kraft pulp mills produce excess renewable electricity and heat in the form of steam and hot water during normal operations (Vakkilainen and Kivistö 2014). This excess electricity can be either sold or used internally for the production of chemicals or paper production. Part of the steam is used for pulp production, but in large modern mills, the condensing tail is used in a turbine to convert excess steam into electricity. The integration of fuel production for the lime kiln into the kraft mill process can bring synergistic benefits that make the fuel production process more feasible compared with stand-alone operations. The lime kiln fuel replacements considered in this study were hydrogen, producer gas, torrefied biomass, lignin, and pulverized biomass. Some of these—hydrogen and producer gas—have been successfully used in lime kilns before, and some can be regarded as newly introduced promising alternatives. Apart from fossil fuel-free operation, the integration of biofuel production processes offers interesting new possibilities for increasing mill capacity and gaining additional revenue by the production of advanced bioproducts. Hydrogen production from water using alkaline electrolysis is a well-known commercial process (Millet and Grigoriev 2013; Lehner et al. 2014). In a pulp mill, excess electricity can be used on-site for hydrogen production in electrolyzers (Kuparinen et al. 2016b). Gasification of biomass followed by producer gas firing in a lime kiln is a known technology and has been used in a number of pulp mills in Scandinavia (Wadsborn et al. 2007; Vakkilainen and Kivistö 2008; Metsä Group 2013). Torrefied biomass is produced by the mild heating of biomass in the absence of oxygen, and its properties resemble those of coal (Koppejan et al. 2012). Torrefied biomass has not yet been used to fuel lime kilns in commercial operations, but the option has recently been studied, as has the possibility of integrating torrefaction in pulp mill processes (Hamaguchi et al. 2013; Kukkonen 2014). Lignin extraction from black liquor and its use for a wide range of purposes has been studied widely; a possible and easily achievable usage is as lime kiln fuel (Vakkilainen and Kivistö 2008; Lundberg et al. 2013; Manning and Tran 2015). Dried and pulverized biomass can be easily combusted in lime kilns (Wadsborn et al. 2007; Stora Enso 2015). The objective of this study was firstly, to analyze the technical possibilities and constraints of integrating renewable lime kiln fuel production into the pulp production process and secondly, to estimate the economic feasibility of the chosen concepts. The techno-economic effects of the above-listed integration concepts on the pulp production process were examined by analyzing the mass and energy balances of an example mill. Figure 1 presents an overview of the studied kraft pulp mill operations and technologies. The mill considered in this work was a large kraft pulp mill located in South America producing 1.5 million air-dry tons of bleached eucalyptus pulp annually. Several mills of this type have started operation recently. Potential advantages and disadvantages of the integration for existing pulp production process operations, along with requirements of a framework for feasible concepts, were assessed. The selected renewable fuel concepts to enable fossil fuel-free pulp mill operations were studied by calculating mass and energy balances for a reference mill. The main parameters and mass and energy flows of the reference mill operations are presented in Fig. 2. A more detailed description of the reference mill can be found in previous work (Hamaguchi et al. 2011; Kuparinen et al. 2016a,b). Calculations were made using an updated Millflow spreadsheet that included detailed mass and energy balances for a pulp mill. A more detailed description of Millflow can be found in earlier work (Vakkilainen and Kivistö 2008; Hamaguchi et al. 2011). Biomass residue was generated in the wood handling processes of the pulp mill, and, in addition to bark, the biomass residues contained other particles such as fines and wood lost during mill debarking. Steam was generated only in the recovery boiler. Because of the small wood residue flow, there was no separate power boiler and therefore no use for the biomass residue generated. Steam was used for power generation and in the mill processes. There were abundantly available low temperature heat flows that were used, for example, to dry biomass residue. Electricity generation exceeded the mill power requirements, and thus the sale of excess electricity was possible. Fuel properties affect the operation of the lime kiln. The properties of the studied renewable fuels were compared with the fossil fuels typically used in lime kilns; the results are shown in Table 1. Lime kiln operation requires stable combustion conditions as well as easily controllable hot-end temperature. Therefore, fuel quality should be stable and consistent. Variations in fuel heating value and moisture affected the flow and temperature profile of the flue gas. Alternative solid fuels fired in lime kilns can include non-process elements as contaminants, which tend to accumulate in closed cycle processes such as the lime cycle (Hamaguchi and Vakkilainen 2011). These impurities can cause corrosion, ring formation in the kiln, and adverse environmental effects, in addition to having an unfavorable effect on the quality of the lime. Increased amounts of contaminants can lead to increased use of make-up lime. High fuel moisture content decreases the heating value of the fuel and the system efficiency and also increases the amount of flue gas. The fuel heating value needs to be high enough to enable the desired flame temperature at the lime kiln hot-end (Vakkilainen and Kivistö 2008). Combustion of biomass-based fuels lowers the hot-end temperature in the kiln due to the lower adiabatic flame temperature (Isaksson 2007). To maintain the kiln production capacity, higher firing rates were required, which caused an increase in the back-end temperature and higher flue gas heat loss. Therefore, in the case of biomass fuels, an additional increase of 3% in fuel consumption based on input lower heating value (LHV) was assumed. Pretreatment of biomass residue is required whether the residue is gasified, torrefied, or pulverized for fuel use. Pretreatment reduces problems in the fuel feeding systems and improves the efficiency of the conversion or combustion processes. Undesired elements such as sand and metals need to be removed to prevent problems in the equipment during processing. Biomass pretreatment includes drying, chipping, and grinding in order to achieve the desired moisture content and particle size, which vary according to the chosen conversion process. Flue gas or secondary heat in the form of hot or warm water as well as recovered steam from the pulping process can be used for drying. There is considerable risk of fire in the fuel feeding system when flue gas is used for drying wood (Wadsborn et al. 2007). Therefore, from the viewpoint of fire safety, the use of steam or hot water is recommended. In the calculations of this work, a moisture content of 45% was assumed for the received biomass residue, and 65 °C water from the mill processes was used for drying. Electricity consumption in grinding depended on the type of material and required particle size. When a rotating grinder and a belt drier was chosen, the electricity consumption for pretreatment was estimated at 192 kWh/t based on vendor data. Integration of water electrolysis in a pulp mill followed by hydrogen combustion in the lime kiln has been previously studied (Kuparinen et al. 2016a,b). The integration concept with main data for the reference mill is presented in Fig. 3. Renewable excess electricity produced in the mill was used in the electrolyzer, replacing the 3.4 MW that was needed for oxygen production in the base case. With the electrolyzer, separate oxygen production was not needed. The production of hydrogen was limited by the availability of electricity; in the studied case the electrolyzer covered 72% of the heat demand of the lime kiln. The oxygen requirement of the pulping process was 20 kg/ADt (Kuparinen et al. 2016b), which was only a part of the oxygen produced by the electrolyzer. Cooling of the electrolyzer produced heat in the form of +75 °C hot water, which could be utilized if there were demand for heating. Hot water production from cooling of the electrolyzer could be replaced by the production of low pressure steam by a reboiler. Water for the electrolyzer can be purified using the existing water treatment facility, which would increase the load at the mill’s water treatment plant in the example case by 12%. 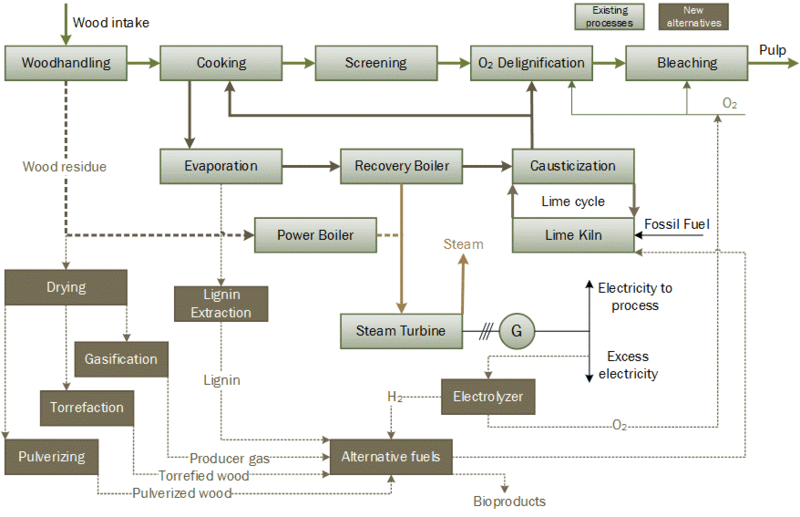 Biomass gasification for lime kiln use is a well-known process (Isaksson 2007; Francey et al. 2011; Metsä Group 2013). 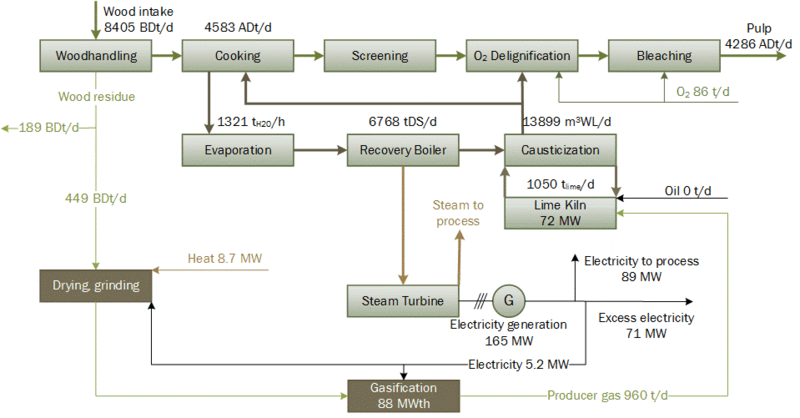 The producer gas concept for the reference mill, including the main mass and energy flows, is depicted in Fig. 4. Biomass drying before gasification is essential to improve the efficiency of the process. Moisture in the fuel notably increases the amount of flue gas from the lime kiln (Isaksson 2007). In these calculations, 15% moisture content and an average particle size of 6 mm before gasification were used. These are recommended values for a circulating fluidized bed (CFB) gasifier (McKendry 2002; Basu 2010). The calculations are based on CFB gasifiers that are the most used commercial gasifiers and able to gasify biomass of varying quality. Particles like sand or metals are removed in the biomass pretreatment process prior to gasification, and minor contaminants can be handled in the gasification process (Worley and Yale 2012). The integrated gasifier increased the amount of electricity used at the mill. The increase was mainly from biomass pretreatment, but also from the gasifier air fans, whose consumption was estimated at 1.1% of the thermal power of the gasifier. 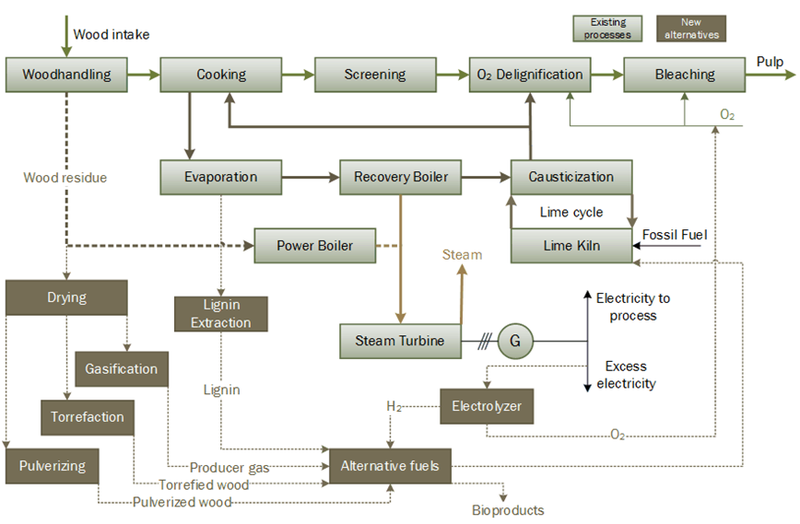 In the gasification process, part of the contaminants of the biomass exited the gasifier with the bottom ash, and therefore the amount of non-process elements that ended up in the lime cycle was lower than with, for example, wood combustion. Make-up lime increase due to contaminants was assumed at 2 kg/ADt (Isaksson 2007). Upgraded biomass can be produced by torrefaction, which is a mild pyrolysis process occurring at atmospheric pressure in the absence of oxygen. The operating temperature is approximately 200 to 300 °C with a residence time in the range of 0.5 to 2 h. Torrefaction increases the energy density of biomass, reduces its moisture content, and makes it hydrophobic and brittle. Typically, biomass loses 30% of its mass and 10% of its energy content during torrefaction, depending on the process details (Schorr et al. 2012). The behavior of biomass in the torrefaction process depends on the type and composition of the biomass (Prins 2005). Because they are processed, raw material quality requirements are not strict (Schorr et al. 2012). Therefore, residual biomass from pulp production is a material well suited for torrefaction. Integration of torrefaction into a pulp mill process has been studied previously (Hamaguchi et al. 2013; Kukkonen 2014). The properties of torrefied biomass are close to those of coal, and, therefore, torrefied biomass can replace coal in many applications without notable modifications to the combustion equipment. Coal is commonly used in cement kilns, which resemble the lime kilns found in pulp mills. Torrefied biomass can be combusted as a main fuel in lime kilns using pulverized fuel burners. When used as additional fuel, torrefied biomass can either be mixed with lime mud or blown to the kiln from the burner end. In the example case, the energy content of the torrefied biomass was set at 18.7 MJ/kg (LHV) based on the experimental results of torrefaction of eucalyptus (Eucalyptus grandis) wood and bark (Almeida et al. 2010), when operating temperature was 250 °C and residence time 1 h. Size reduction is relatively easy for torrefied wood due to its brittleness; size reduction of torrefied wood consumes 70% to 90% less energy than pulverized wood (Bergman 2005). The torrefied biomass concept for the reference mill is presented in Fig. 5. The biomass was pre-dried before torrefaction, and pulverized torrefied biomass was fed into the lime kiln. The process was scaled to meet the heat demand of the lime kiln. Torrefied biomass ash included elements that could be harmful in the lime cycle, but problems can be prevented by increasing the make-up lime addition. In this case, an addition of 3 kg/ADt was estimated. Lignin content in eucalyptus is typically 26% to 27% (E. grandis, E. saligna; dry basis) (Almeida et al. 2010). In the kraft pulp production process, approximately half of the wood entering the cooking process is converted to pulp, and the rest of the organics are typically combusted in the recovery boiler for energy production. 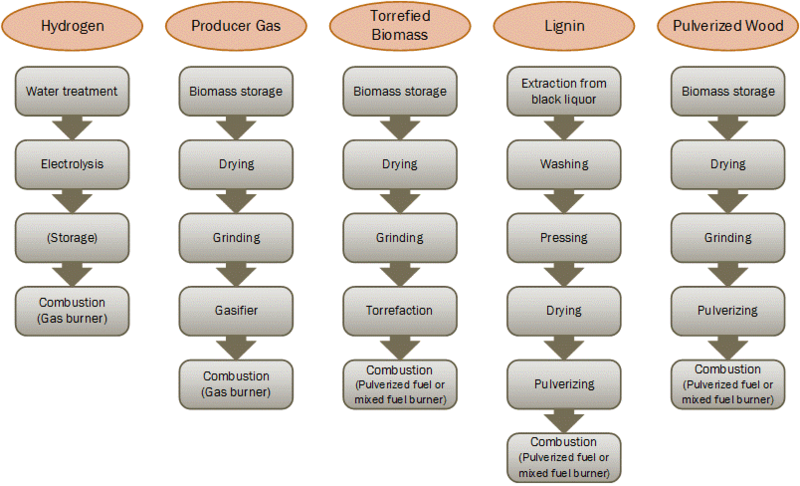 Lignin can be separated from black liquor, before the recovery boiler, to be used as fuel or to be refined further into other products (Björk 2016). Possible lignin separation methods are membrane filtration after the digester and acidic precipitation and dewatering at the evaporation stage (Vakkilainen and Kivistö 2008). Lignin separation using an acidic precipitation method called LignoBoost and combustion in a lime kiln have been tested in Sweden (Tomani 2010). The method is currently in use in Finland (Björk 2016). Several studies have been made to examine the effects of lignin separation on pulp mill operations and dimensioning (Axelsson et al. 2006; Vakkilainen and Kivistö 2008; Vakkilainen and Välimäki 2009; Hamaguchi et al. 2011). Precipitation of lignin from black liquor is based on the decreased solubility of lignin when the pH is lowered. In the LignoBoost process, CO2 with H2SO4 are used in a two-step process to lower the pH (Tomani 2010; Gellerstedt et al. 2012). CO2 can be either purchased or separated from the lime kiln or recovery boiler flue gases. Using lime kiln flue gas as a source of CO2 decreases the chemical cost by 20% to 25%. Precipitated lignin is a hydrophobic filtercake with 30% to 40% moisture content (Tomani et al. 2011), and it can be dried further and pulverized before utilization. Lignin includes free sodium and sulfur, which may cause ringing in the lime kiln. Sulfur content after the LignoBoost process is approximately 2% to 3%, and its sodium content can be decreased by washing to a level acceptable for lime kiln use (Gellerstedt et al. 2012). Standard burner and feeding equipment can be used for lignin combustion in lime kilns. No notable adverse effects to lime kiln operation nor to emission levels were detected in trials conducted in a Swedish kraft pulp mill (Tomani et al. 2011). Lignin removal affects the properties of black liquor and, consequently, the operation of the recovery boiler. Lignin removal decreases the steam load and flue gas production of the recovery boiler, which is often a bottleneck in the pulp production process. Therefore, it has been introduced as a method to enable an increase in pulp production capacity without an expensive upgrade of the recovery boiler (Axelsson et al. 2006; Vakkilainen and Kivistö 2008). If the mill production remains unchanged, steam production at the recovery boiler decreases and, as a result, electricity generation decreases as well. The addition of sulfuric acid affects the mill Na-S balances. The washing of precipitated lignin increases the load of the evaporation plant because the washing filtrates are returned to the evaporation (Hamaguchi et al. 2011). In the calculations in this work, an increase of 2 kg per kg of extracted lignin was taken into account, but it was assumed that the nominal capacity of the evaporation plant could be kept unchanged. In the studied concept, lignin removal was scaled to meet the lime kiln heat demand, and pulp production was kept at the base case level. The main mass and energy flows are depicted in Fig. 6. To fire the lime kiln, 280 t/d lignin at 10% moisture was needed. This was equal to a 16% extraction rate from black liquor. Electricity consumption in the lignin removal process was estimated at 80 kWh/t (Laaksometsä et al. 2009). Additional electricity consumption of 0.3 MW for drying and pulverizing was included. Pulverized wood has been tested and used as lime kiln fuel (Wadsborn et al. 2007; Stora Enso 2015). The combustion of unsorted wet wood and bark in a lime kiln is challenging due to high moisture content, varying particle size and heating value, unpredictable flow characteristics, and the high content of non-process elements. Drying and pulverizing the biomass is required for stable operation. Pulverized fuel burners can be used, or when wood is used as additional fuel, pulverized biomass can be mixed with lime. The characteristics of wood make pulverizing wood more energy-intensive than, for instance, the pulverization of coal or torrefied biomass. A pulverized wood case for the reference mill was evaluated in previous work (Kuparinen et al. 2016a). Figure 7 shows the main process flows of the concept. Make-up lime use increased due to contaminants in the wood; an increase of 3 kg/ADt was assumed for these calculations. The moisture content of the residue after drying was 15%. For pulverized wood firing, the required average particle size is below 1 mm. The electricity consumption of pulverization using hammer mills is roughly 50 kW/MWth. In previous trials, the most common problems with pulverized wood firing were fires in the fuel feeding system and clogging in the hammer mills (Wadsborn et al. 2007). Unplanned shutdowns of the fuel feeding system require the use of fossil fuels unless a backup renewable system exists, thus increasing costs. The costs of each renewable lime kiln fuel scenario depend on the process equipment and required auxiliary equipment, as well as the storage facilities needed. Figure 8 compares the process stages in each studied concept. For biomass fuels, the pretreatment processes had considerable impact on the process costs. Hydrogen production using alkaline electrolysis is a developing technology, and it can be expected that the price will decrease in the near future as power-to-gas processes become more common. Investment and operational costs for selected processes were estimated based on information from recent projects and vendor data. None of the studied wood residue based processes are commonly used. Electrolyzers have not been previously used in pulp mills on this scale, nor for this purpose. The economic evaluation of the concepts is challenging due to uncertainties and a lack of references related to prices, local conditions, and the size of required storage. Consequently, the results should be considered as best estimates with no better than ±30% accuracy. A lifetime of 20 years, an interest rate of 10%, an operation time of 8400 h/a, and operation and management costs in the range of 5% of the investment were assumed for all the cases. Other assumptions made for the economic analysis are given in Table 2. Possible incentives for renewable fuel use or savings from costs of carbon dioxide emissions can affect the cost-effectiveness of the fuel choice, but these were not taken into account in the calculations. Although there are plans for emissions trading in South America, they have not yet been put into action (ICAP 2016). It was assumed that biomass has a market value; this value, however, can vary depending on the local conditions, and it may even have a disposal cost instead. The value of replaced oxygen is case-specific and dependent on sourcing, because oxygen can be produced on-site or purchased. When comparing the investment costs, it should be noted that hydrogen covered the heat demand of the lime kiln only partly (72% of total kiln energy), while the other fuels were considered as the sole fuel to be fired. The technical implementation of all of the studied processes is possible and feasible, and they can be integrated in a pulp mill without adverse effects on the actual pulp production process. Full or partial fossil fuel replacement utilizing existing side streams, namely residual biomass or excess electricity, is technically possible. The main parameters from the integrated mill calculations are given in Table 3. In the reference mill, all the concepts except for the electrolyzer concept offered the possibility of fully substituting fossil fuels in lime kiln. Using the electrolyzer, 45 t/d of oil was still needed to cover 28% of the kiln heat demand. The power balance of the mill was affected by the renewable fuel production, and the amount of sellable electricity decreased in all of the cases. In the hydrogen case, all excess electricity was used for renewable lime kiln fuel production. 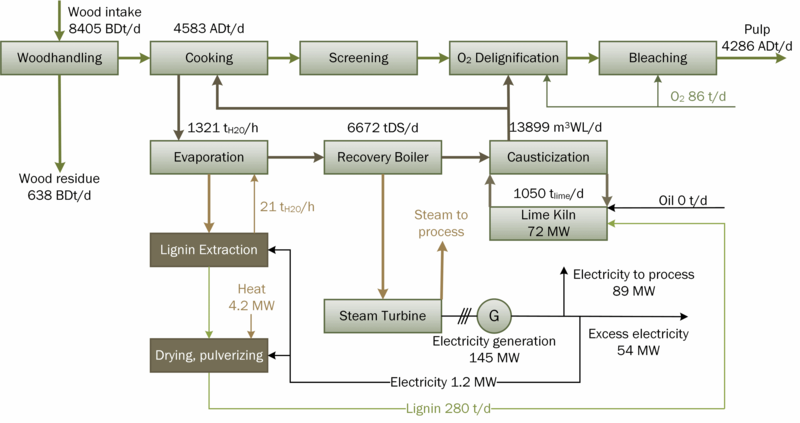 Lignin extraction decreased the amount of organics ending up in the recovery boiler, and therefore markedly less steam and electricity was generated. In the studied case, the biomass residue generated in the wood handling process of the mill was sufficient to cover the lime kiln heat demand. There was actually excess biomass available in all of the cases. Combustion of biomass residue in a power boiler would offer a possible increase in the amount of produced electricity. Especially in the hydrogen case, a power boiler could be used to increase hydrogen production or to produce electricity for sale. In the lignin extraction case, lignin removal affected the recovery boiler balance and caused a decrease in electricity production. On the other hand, lignin extraction offered a possibility to increase the capacity of the recovery boiler, which is often a bottleneck in pulp production. Consequently, additional revenue could be gained by increasing the pulp production of the mill without the need for expensive modifications to the recovery boiler. The main concern of the biomass-based lime kiln fuel concepts was unforeseen stoppages in the fuel feeding and pretreatment systems. Additionally, the fire risk needed to be considered, especially if flue gas instead of water or steam were used for biomass drying. Stoppages are quite common in biomass processes, and they reduce the availability of the system. Consequently, occasional fossil fuel use or biofuel storage is required to maintain mill operations during unforeseen breaks. The costs of possible biofuel storage or increase of occasional fossil fuel use were not included in the cost calculations. All the integrated processes either produce or use low temperature heat in the form of hot water. Secondary heat is an abundant resource in modern kraft pulping processes and, as a result, the need for heat does not substantially affect the cost of the process. Biomass-based fuels include contaminants that mix with lime and may accumulate in the lime cycle. This can be mitigated by increasing lime replacement by adding make-up lime use. The profitability of the studied concepts depends primarily on the difference between the renewable fuel production cost and the cost of the replaced fossil fuel—in this case, fuel oil. In Fig. 9, the breakeven lime kiln fuel price for each case is presented as a function of electricity price. When the oil price exceeds the calculated breakeven price, the case is considered economically feasible. 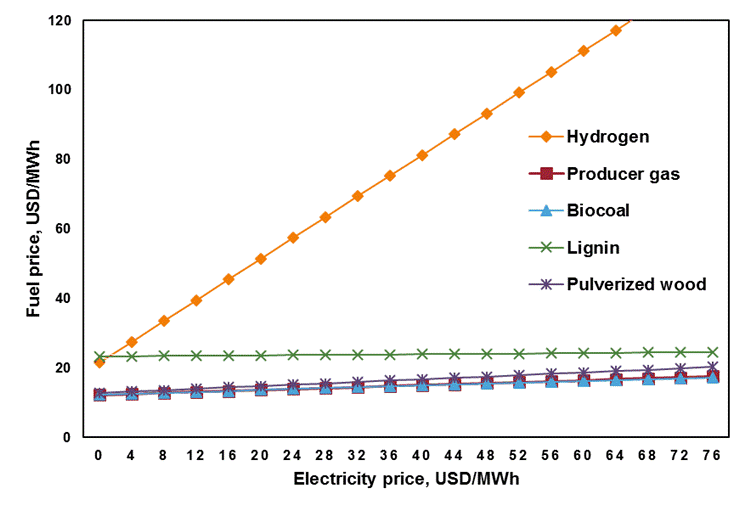 In the lignin case, the breakeven price varies in the range of 23 to 25 US$/MWh (40 to 43 US$/bbl). In the biomass conversion cases, the breakeven prices were in the range of 12 to 20 US$/MWh (20 to 35 US$/bbl). The lowest renewable fuel price was found in the producer gas case, but the results of the biomass conversion cases were close to each other. The profitability of the hydrogen concept is highly dependent on the price of electricity, which should be remarkably lower than current levels in, for example, Brazil, thus making the concept profitable considering current oil prices. The OECD (2016) estimates the crude oil price in 2017 and 2018 at 45 US$/bbl, which equals 26 US$/MWh. For a pulp mill, the refinery margin, cost of transport, and taxes need to be added to the price calculations. The biomass cases seem to be profitable considering the current oil price development. The hydrogen case seems to be feasible only with a low electricity price or high oil price. Considering recent oil price developments at the time of writing, the case is unlikely to be profitable when the alternative is to sell electricity. However, when selling electricity is not possible due to local conditions, for instance, if the mill is located in a remote area or the local electricity price is low, then the integration of an electrolyzer can offer a reasonable alternative for savings in operational costs. The benefits of the electrolyzer concept in the example case include savings from the replacement of separately produced oxygen. The more efficient utilization for oxygen from the electrolysis process would increase the profitability of the concept. Only 28% of the produced oxygen is used in the pulping process, and excess oxygen is vented to the atmosphere in the example case. The purity of oxygen produced in an alkaline electrolyzer is high, and additional revenue can be gained by selling it when there is market demand. Another option is to utilize the oxygen in mill processes to, for example, increase the capacity of the recovery boiler by way of oxygen-enriched air combustion (Verloop et al. 2001). The profitability of the producer gas, torrefied biomass, lignin, and pulverized wood cases depends primarily on the fossil fuel price, and secondly on the investment cost, while the impact of the electricity price is less noticeable. The payback period for these cases as a function of oil price was calculated in order to compare the profitability of the cases. Two electricity prices, 35 US$/MWh and 75 US$/MWh, were used. The results are presented in Fig. 10. The results of the producer gas and torrefied biomass cases were close to each other due to investment costs being of the same order. They were also the most profitable concepts in the example mill case. 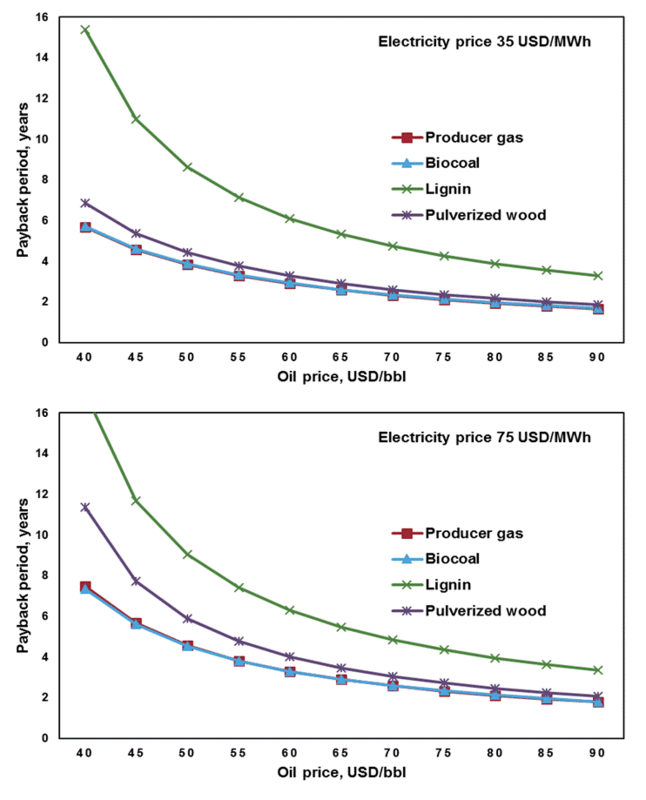 The lignin concept was more sensitive to variation in the price of oil, while the pulverized wood case was the most sensitive concept in relation to the electricity price. The impact of changes in the electricity price reduces as the price of oil increases. Electrolyzers are an emerging technology, and the investment costs of alkaline electrolyzers can be expected to decrease when implementation of the technology becomes more common. Additionally, more advanced technologies such as solid oxide electrolysis cells (SOEC) are under research, and these may permit more efficient integration concepts in the future. In addition to fossil fuel replacement, the studied technologies offer a possibility to integrate downstream processes to convert biomass or hydrogen into biofuels or biochemicals in order to find new revenue streams. Lignin is not only a fuel but also a valuable resource for further use as a bio-based raw material. Several technically possible ways to replace fossil fuels in modern kraft pulp mill lime kilns were found by utilizing the existing side streams of the mill process, such as biomass residues and excess electricity produced at the mill. These renewable fuel production processes were integrated into pulp mill processes without noticeable effect on pulp production. The attractiveness of each integration concept was highly dependent on the price of fossil fuels and the taxes levied. The most favorable alternative for each mill depended on the local conditions and the operational specifics, and an individually customized solution is therefore needed. Processing biomass into biofuels and extracting lignin from black liquor for use as a renewable lime kiln fuel were implemented in a technically and economically feasible way. In a typical South American kraft pulp mill, all of the studied options could be used to fully substitute fossil fuel in the lime kiln during normal operation. The integration of an alkaline electrolyzer to produce hydrogen for fuel use could be a feasible alternative when electricity prices are low, when electricity cannot be sold due to local conditions, or when additional oxygen production capacity is needed in the mill. Arpalahti, O., Engdahl, H., Jäntti, J., Kiiskilä, E., Liiri, O., Pekkinen, J., Puumalainen, R., Sankala, H., Vehmaan-Kreula, J., Halinen, E., et al. (2008). “White liquor preparation,” in: Papermaking Science and Technology: Volume 6 Chemical Pulping. Part 2 Recovery of Chemicals and Energy, P. Tikka (ed. ), Paper Engineers’ Association/Paperi ja Puu Oy, Helsinki, Finland. Axelsson, E., Olsson, M. R., and Berntsson, T. (2006). “Increased capacity in kraft pulp mills: Lignin separation and reduced steam demand compared with recovery boiler upgrade,” Nordic Pulp and Paper Research Journal 21(4), 485-492. Basu, P. (2010). Biomass Gasification and Pyrolysis. Practical Design and Theory, Academic Press, Oxford, UK. Bergman, P. C. A. (2005). Combined Torrefaction and Pelletisation – The TOP Process, (Report No. ECN-C-05-073), Energy Research Centre of the Netherlands (ECN), Petten, The Netherlands. Björk, M. (2016). “Lignin recovery in Sunila pulp mill,” in: Recovery Boiler Day 2016 (Report No. 16A0913-E0174), Finnish Recovery Boiler Committee, 27 October, Tampere, Finland. Francey, S., Tran, H., and Berglin, N. (2011). “Global survey on lime kiln operation, energy consumption, and alternative fuel usage,” TAPPI Journal 19(8), 19-26. Hamaguchi, M., and Vakkilainen, E. (2011). “Influence of chlorine and potassium on operation and design of chemical recovery equipment,” TAPPI Journal 10(1), 33-39. Hamaguchi, M., Vakkilainen, E., and Ryder, P. (2011). “The impact of lignin removal on the dimensioning of eucalyptus pulp mills,” Appita Journal 64(5), 433-439. ICAP (International Carbon Action Partnership) (2016). Emissions Trading Worldwide: Status Report 2016, International Carbon Action Partnership, Berlin, Germany. IEA (International Energy Agency) (2014). Energy Technology Perspectives 2014, OECD/IEA, Paris, France. Isaksson, J. (2007). “Meesauunikaasutin (Lime kiln gasifier),” Recovery Boiler Seminar (in Finnish), Helsinki, Finland. Koppejan, J., Sokhansanj, S., Melin, S., and Madrali, S. (2012). 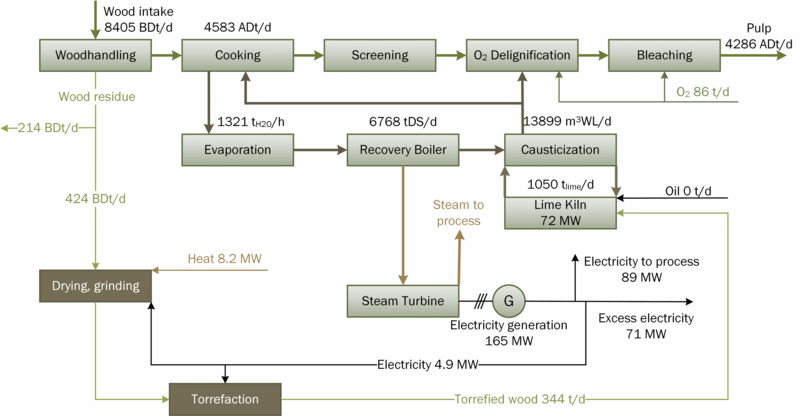 Status Overview of Torrefaction Technologies, IEA Bioenergy Task 32, Enschede, The Netherlands. Kukkonen, O. (2014). Biohiilen Teknistaloudelliset Käyttömahdollisuudet Meesauuneissa (Technical and Economical Usage Possibilities of Torrefied Biomass in Lime Recovery Kilns), Master’s Thesis (in Finnish), Lappeenranta University of Technology, Lappeenranta, Finland. Kuparinen, K., Vakkilainen, E., and Kärki, J. (2016a). “Electrolysis and biomass conversion as options to produce renewable alternatives for fossil lime kiln fuels,” in: TAPPI 2016 PEERS Conference Proceedings, Jacksonville, FL. Kuparinen, K., Vakkilainen, E. K., and Ryder, P. (2016b). “Integration of electrolysis to produce hydrogen and oxygen in a pulp mill process,” Appita Journal 69(1), 81-88. Manning, R., and Tran, H. (2015). “Impact of cofiring biofuels and fossil fuels on lime kiln operation,” TAPPI Journal 14(7), 474-480. Metsä Group (2013). “Metsä Group Sustainability Report 2012,” Metsä Group, (http://www.metsagroup.com/en/Documents/Sustainability/Metsa-Group-Sustainability-Report-2012.pdf), Accessed 16 November 2016. OECD (Organisation for Economic Co-operation and Development) (2016). “Economic outlook no. 100, November 2016,” OECD, (http://stats.oecd.org/Index.aspx), accessed 29 November 2016. Schorr, C., Muinonen, M., and Nurminen, F. (2012). Torrefaction of Biomass, Miktech Oy, Mikkeli, Finland. Progress_Book_2015_ENG.pdf), accessed 23 May 2016. Tomani, P., Axegård, P., Berglin, N., Lovell, A., and Nordgren, D. (2011). “Integration of lignin removal into a kraft pulp mill and use of lignin as a biofuel,” Cellulose Chemistry and Technology 45(7-8), 533-540. Vakkilainen, E., and Kivistö, A. (2008). Fossil Fuel Replacement in the Pulp Mills (Research report EN A-58), Lappeenranta University of Technology, Lappeenranta, Finland. Vakkilainen, E., and Kivistö, A. (2014). Forest Industry Energy Consumption – Trends and Effects of Modern Mills (LUT Scientific and Expertise Publications, Reports, 38), Lappeenranta University of Technology, Lappeenranta, Finland. 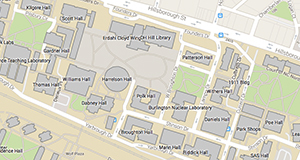 Verloop, A., Dye, N., and Homer, G. (2001). “Concept description and safety considerations for the application of oxygen enriched air (OEA) technology in recovery boilers,” in: 2001 TAPPI Engineering/Finishing and Converting Conference Proceedings, San Antonio, TX. Wadsborn, R., Berglin, N., and Richards, T. (2007). Konvertering av Mesaugnar från Olje- till Biobränsleeldning – Drifterfarenheter och Modellering (Conversion of Lime Kilns from Oil Firing to Biofuel Firing: Operating Experience and Modelling) (Report No. 1040) (in Swedish), Värmeforsk Sverige AB, Stockholm, Sverige. Worley, M., and Yale, J. (2012). Biomass Gasification Technology Assessment – Consolidated Report (Subcontract Report NREL/SR-5100-57085), National Renewable Energy Laboratory, Golden, CO. Article submitted: February 1, 2017; Peer review completed: March 26, 2017; Revised version received and accepted: April 10, 2017; Published: April 18, 2017.